New Years Eve was a little of the usual and the unusual this year. The usual – a gathering of friends and family with food, beverages and fun conversation. The unusual – a covert operation to sniff out my wedding photos, a dog weigh–in, some of the best Chinese-Filipino food I have ever tasted and in bed by 10:30 pm. The family gathered at the inlaws house. They have a spacious home with one of the most unique Asian flairs combined with American functionality. That just about describes the inlaws so when you see little red fringy things hanging in the doorways and small hand-crafted wooden roadblocks at the entrance to each room to keep the dogs out – well something about that just shouts “this is so mom and dad”. There was a delicious assortment of Chinese-Filipino food. I’m not big into Asian food – which has been both a blessing and a curse being married to Chris. Lucky for me, Chris is not a big fan either (it doesn’t make sense but taste enough sticky rice and you can see where he’s coming from). Like most multi-generational homes, food at the inlaws home – Asian or not – is king (actually queen) and life. Popo is always cooking up ethnic food. It reminds me of growing up with my own grandmother, permanently planted in the kitchen with a pot of sauce simmering with Italian spices being stirred with a wooden spoon that served not only as a utensil but also an extension of her Italian hands when talking and a weapon for the sassy, the indolent or just when she wanted to make a really emphatic point. Especially on holidays, Popo stands authoritative in the kitchen with her big metal pots slowly simmering. But not today. The food was actually catered from a family friend who provided a most interesting menu. Spicy squash fried into stringy cakes, chicken and noodles cooked with dangerously tasty amounts of turmeric, sticky rice with coconut rolled into corn husks, fried rice, grilled pork, cassava, flan. It was delicious enough to make me want to return the next day for leftovers for another belly full. While all of that was enough to stuff me 10 times over, I believe it was Meredith’s homemade peanut butter cups that put me over the edge. She should probably share the recipe or at least stand on a street corner to sell these things because they are Good with a capital G.
After the feasting, conversation broke out while I broke away for a covert operation. You see, our wedding photos have gone missing. Last seen on the desk at the inlaws house about a year ago. If you do the math, you will realize that we were married over 3 years ago and still there are no photos aside from the ones in a big box (the box that went AWOL). My mom – not pleased about this. The operation was covert because it was assumed that because the pictures were now missing that I of course had them at my house. I hunted all over my house and could not find them. My assumption then was that they were at their house. Their house has about 100 closets that are cavernous and stacked high with boxes of Christmas decorations, shoes and other random things wrapped in plastic grocery bags. I didn’t want anyone to catch on that perhaps I doubted. I had a feeling that given 10 minutes I could find them and prove myself as the not-as-crazy-as-you-think-even-though-she-is-33-and-still-no-babies daughter-in-law. I had a point to prove. Mr. Tom tipped me off saying there was a good chance the photos could be hiding in the coat closet behind a stack of boxes wrapped in plastic bags. Going on this, I casually made my way towards the closet looking like I might be using the washroom. Darted right instead of left and found myself in a closet full of coats and shoes. There we so many coats, furry things and boxes that it was scaring me. But I quickly got over myself to look for the box of photos. Finally when I realized they were not there, I gave everything one more look just to be sure when I realized I was sliding out on the floor. At that moment I smelled something really bad. Usually when you’re in a room by yourself and you smell something bad you at least have a warning. But this took me off guard. I picked up my foot, looked at the bottom of my sock and realized it was covered in crap. My first reaction was that Popo booby trapped the closet because she knew I doubted and would hunt for the pictures. My second reaction was there is no way this was from my dog because I cleaned him out before we brought him over. My third reaction was somehow I have to get this cleaned up without setting off Popo – and a string of questions along the lines of what were you doing in the closet? The mess got cleaned up and all of a sudden I am at the party without my socks. But still on a mission. Next stop was Chris’ old bedroom. Mr. Tom’s insider tip came up empty and I had this sneaky suspicion that the pictures were hiding Chris’ room. I snuck upstairs, opened the closed door to be greeted with even more shoes. Most have 6 inch heels and one pair was vinyl. Not kidding. I think I saw light blue 6 inch vinyl heels in there. Wondering how, why or…ok whatever, I see it there. I have found the box of photos snug under two plastic boxes that store shoes. Immediately I rescue it and tell Mr. Tom the mission is complete. He asks why I am not wearing socks. I explain that I stepped in a bit of poopy which was a small price to pay for finding the wedding photo box. Next up – for even more fun – we did dog weigh in. You will learn now how Chris does not fall far from the parental tree. He with his electric level is no match for his dad’s workshop. He has a tool for everything including weighing dogs. We bring each dog downstairs to find their weight. Or something like that. We recorded all of the weights because we have big plans to put together a contest where you guess MegMeg’s baby in dog weight. MegMeg is Chris’ youngest sister who is ready to pop any day with baby Aubrey. Aubrey is already 6.5 pounds and my guess is she comes out around the size of Chewie. The good news is that I weigh more than a small dog and a 13 year old boy. The bad news is that later Mr. Tom tells me the scale can only weigh up to 25 pounds. So I do not weigh 25 pounds. DAMMIT! I’m still not sure what all of this means. I would say that my New Years Eve excitement stopped there but it didn’t. Next I dressed Boss in pink booties. Earlier in the day, I took Boss outside for morning crazy laps. He busted out two laps in the frost-covered field before he started limping with one paw up then finally sat in the grass alternating lifted paw. He can’t take the cold. 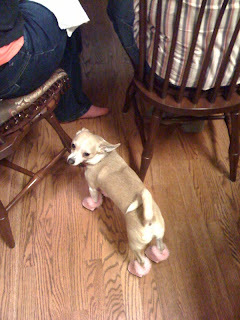 Leave it to the mother-in-law to have a pair of pink velvet booties for small dogs. Mr. Tom suggested I try them on Boss. It started with one bootie and Boss walking around like he was part of a militant army hailing the new chief. Three paws down, one lifting high – HAIL the chief – three paws down, one lifting high – HAIL! What’s more fun? Putting on two, then three then all four. As you can see, Boss is thrilled with his new boots. After a few minutes he did figure out how to manage walking in clown boots and put on a good show. I think overindulgence in food hit me, too much excitement from watching Boss and Thor fight, a covert mission, a weigh in – all of this added up to shutting down at 10:30 pm. At which point I went home, fell asleep only to be waken by the idiot who decided to ring in the new year with 20 minutes of midnight fireworks. Boss didn’t think so either as he barked back for 20 minutes straight. So it is here, the New Year. I have been waiting for January 1st for quite some time. It signals a new start. In my mind I picture the year as a giant calendar. Every December 31st I find myself at the bottom of the year waiting to leap back up to the top again. Last night I was ready to leap and I’m happy to say that I made it to the top of this new year. 2009 will be a good year. There are many more adventures to be had in triathlon, family, travel and friends. Thank you for reading about my adventures all year. It is fun to share the pieces of my life with you and I promise to keep you entertained throughout the new year.